Pakistan tehreek Insaf PTI Finance minister Asad Umar said in TV Program that PTI will be offer special investment bonds for Overseas Pakistanis on specific good profit rate. 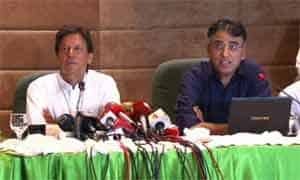 Talking to private news channel the leader of PTI Asad Umar and expected Next Finance minister said he is working on special investment bonds for Overseas Pakistanis. Talking to a private news channel, he said quick decisions would have to be taken to stabilize the national economy. Asad Umar said tax rate would not be enhanced; however, some new commodities would be brought under the tax net. He said all agreements signed by the previous governments with foreign countries, including the deal for import of liquefied natural gas would be presented before the parliament. As recently US secretary of state mike pompeo had warned that any potential IMF bailout for Pakistan should not provide funds to pay off Chinese lenders. On the above anser Asad Umar said USA should worry about its own Chinese debt and let us worry about our own. Overseas Pakistani welcomes special investment bonds for overseas Pakistanis. So if government of Pakistan will offer good profit rates with good terms and conditions many overseas Pakistan will be invest to purchase saving bonds. Still Pakistan tehreek Insaf is not made government so all overseas Pakistanis waiting final and full detail for investment overseas.